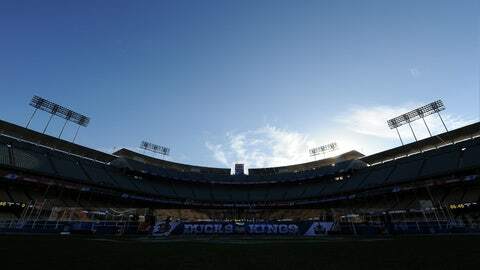 Corey Perry and Matt Beleskey scored first-period goals, and the Anaheim Ducks beat the Los Angeles Kings 3-0 at Dodger Stadium on Saturday night in the NHL’s first warm-weather outdoor game. Jonas Hiller made 36 saves in his 20th career shutout as the league-leading Ducks dominated the landmark meeting of Southern California’s two hockey teams under the stars in Chavez Ravine. Andrew Cogliano added an empty-net goal with 1:29 left to close this unusual chapter in the NHL’s expanded slate of outdoor games. The league threw a California carnival for the event, filling left field with a beach volleyball court and right field with a fireworks-laden stage where Kiss performed. People in shorts and tank tops played Frisbee and practiced yoga between periods while skateboarders rolled past a ball hockey court featuring youth teams. Although the temperature was 63 degrees with significant humidity when Wayne Gretzky dropped the first puck, the ice held up fairly well in the night air. The Ducks’ outstanding season also remained solid in their 21st victory in 24 games, while the Kings lost their fifth straight game. The Kings hosted the first official outdoor game west of the Rocky Mountains in recognition of the NHL’s near half-century in Los Angeles and their rivalry with the Ducks, who joined the league two decades ago. And though this game bore little resemblance to the snowbound outdoor contests in northern climes, visiting teams still improved to 7-1-1 in the NHL’s slate of outdoor games. The teams wore specially designed jerseys for the game, with the Kings’ crown logo dominating their gray jerseys while the Ducks sported bright orange. After a day filled with fan events and celebrations of the cold-weather sport’s rich California roots, Anaheim showed who’s currently in charge of this rivalry. Check out some of the best images from Stadium Series on Saturday. The Ducks followed up their 2-1 victory in Thursday’s rivalry meeting in Anaheim by opening a seven-point lead over Chicago atop the overall standings. Jonathan Quick made 18 saves as the Kings matched their longest skid of an otherwise solid season. After getting a goal in the opening minutes of Thursday’s loss, Los Angeles hasn’t scored in 116 consecutive minutes against the Ducks. Hiller stopped a penalty shot in the first period by Anze Kopitar, the Kings’ leading scorer, and the Swiss netminder turned away every good scoring chance after that in his fourth shutout and 24th victory of the season. The Kings came out flying on the temporary ice, generating 20 shots in the first period. But the high-scoring Ducks got all the shots that counted. Just 2:45 in, Perry scored the first goal in Dodger Stadium history, connecting rather easily on a rebound of Ryan Getzlaf’s shot off a faceoff. Less than six minutes later, Beleskey was alone at the side of Quick’s net to score on a play set up by Teemu Selanne’s pass. Kopitar was awarded a penalty shot midway through the period when Ben Lovejoy hooked him on a breakaway, but the Kings’ leading scorer couldn’t do much with the puck, and Hiller stopped it. Cogliano had the best scoring chance of the second period, but lost the puck on a breakaway. Hiller was outstanding after struggling in his last start against Winnipeg, and Cogliano wrapped up the win in the closing seconds with his 17th goal. NOTES: The crowd was announced at 54,099 — a number that likely made Gretzky smile. … Despite significant public interest, the game didn’t sell out until early Saturday. The NHL overpriced many tickets when they first went on sale, forcing price reductions and refunds in the sections that weren’t selling. … The Kings have missed both of their penalty shots this season. … Perry joined Cristiano Ronaldo as the first players to score a goal in their respective sports at Dodger Stadium. Last August, Ronaldo scored Real Madrid’s first goal against Everton in the stadium’s first soccer game.